Roller burnishing processing is the burnishing tool on the workpiece surface, and moving along the workpiece surface, make the surface produces cold plastic deformation and the deformation strengthening, to have a bright and clean surface machining method, as shown in picture. When machining, a number of cylindrical rollers (including roller outer edges) are configured outside the tool. The diameter of the roller burnishing tool should be slightly larger than the diameter of the workpiece. 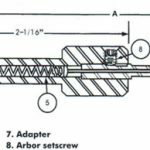 When the tool is rotated, the surface of the hole is pressed flat, resulting in plastic change and cold deformation reinforcement. The roller burnishing process can save a lot of time compared to the process of “re-grinding the hole after heat treatment”. Therefore, rolling pressure is often used for situations where a hard and smooth inner surface is quickly obtained. 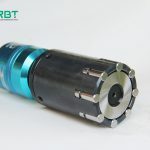 Roller burnishing tool can be used for cylindrical surface, hole surface machining. ← What are burnishing machine’s technical considerations?